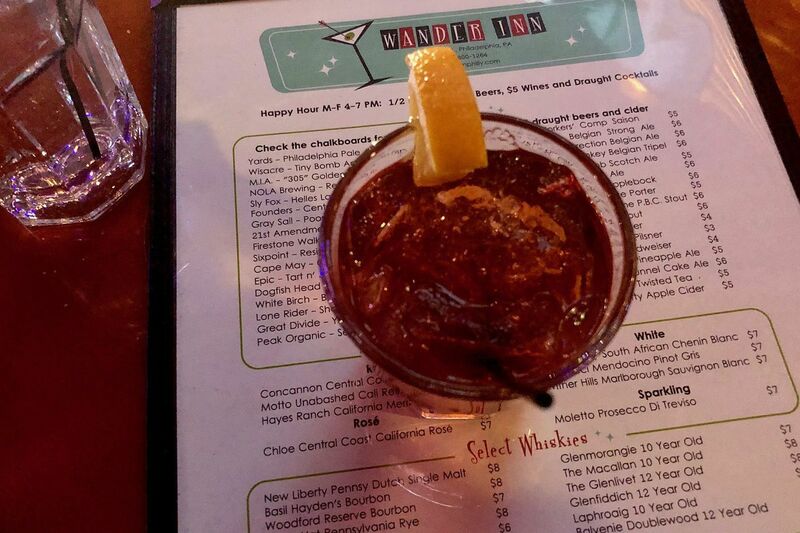 Faber gin negroni at Wander Inn, Third and Porter Streets. Jonn Klein (the Dive, Watkins Drinkery) revived a classic name in Philly taproom lore last summer when he set up this bar at Third and Porter Streets in South Philadelphia. The Wander Inn, once a regular venue of blues legend Bessie Smith, stood for decades across town at 18th and Federal Streets in Point Breeze. It sank into nuisance-bar status by the time of its closing around 2005 and is now the home of American Sardine Bar. This Wander Inn rocks the classic corner bar vibe with killer rock jukebox, blue-casted lighting, galvanized metal cladding the wall behind the bar, and a drink tower made up of pipes and plumbing fittings. Pool table and games are on the second floor. Drink list includes three cocktails on draft (discounted to $5 during happy hour), plus a good supply of whiskeys. Happy hour also means half-price drafts and $5 wines by the glass. Chef Brandon Murray, whose kitchen is open till 1 a.m. daily, puts up various specials both inside and outside the happy hours, including $1 wings on Sunday nights (six-wing minimum) and loaded fry boats ($7) on Friday.